Four new boxes! 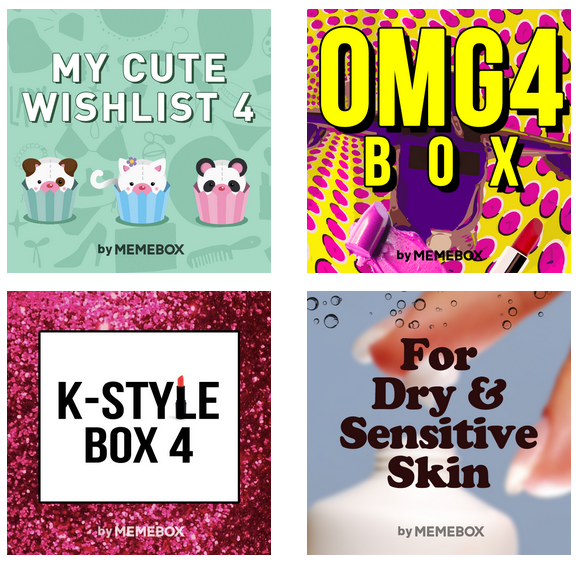 If you've found Memebox late or you missed some of the earlier versions, you can snag a My Cute Wishlist 4, OMG 4 or a K-Style 4. In even better news, theres a new box! For Dry and Sensitive Skin! After all the Oil and Trouble boxes, finally one comes out for those of us with dry skin. With winter coming, this is very tempting. Use the VIP LINK to get the sale prices on these boxes or bundled deals. My Cute Wishlist 4: Get $3 off! Packed with whimsical and effective beauty that will make this box go down in Memebox history! K-Style Cosmetics 4: Get $3 off! Get the update on the beauty forecast in Korea right now! OMG 4: Get $3 off! From bizarre and brilliant, to WTF?! befuddlements, you've got to give these crazies a try! Soothe and solve all your dry and sensitive skin concerns with a few moist-full tweaks to your beauty routine. For Dry & Sensitive Skin: Get $3 off! Soothe and solve all your dry and sensitive skin concerns with a few moist-full tweaks to your beauty routine. I wanted to order the OMG and MCW bundle but could only justify one so I went with MCW. I am kicking myself for not ordering the third edition!